1 Railway Cottages01263 715779work01603 870304fax Self-cateringThis stunning property has been recently converted to provide stylish holiday accommodation, in a lovely secluded spot in the wonderful market town of Holt. Utilities: Gas range cooker, microwave, fridge/freezer, dishwasher, washing machine, tumble dryer. Rooms: 3 Bedrooms, 1 Bathroom, 1 Shower room, sitting room/dining room, kitchen, utility room, cloakroom. Outdoors: Enclosed paved patio, garden furniture, outdoor sofa. Parking: Designated parking for two cars in shared driveway. 1 Railway Cottages offers weekly bookings starting on Friday. 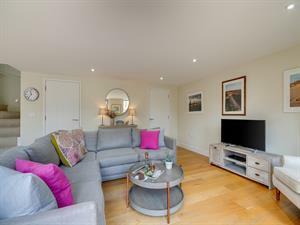 This stunning property has been recently converted to provide stylish holiday accommodation, in a lovely secluded spot in the wonderful market town of Holt.